This fall we launched an unprecedented week-long in person and interactive emergency preparedness game called SF Heroes LIVE. Nearly 150 people in 49 teams competed in fun and creative challenges and tasks that promoted preparedness for any kind of emergency. Teams downloaded the SF Heroes app to their phones and competed for one week to earn points and prizes, while sharing their successes through photos and videos on Facebook and other social media channels. To celebrate the success of all who participated in SF Heroes LIVE DEM hosted an SF Heroes LIVE party for the game players and those who participated in Shakeout at Jillian’s at the Metreon. More than 110 people registered for that event and it was a lively, fun, and packed house. 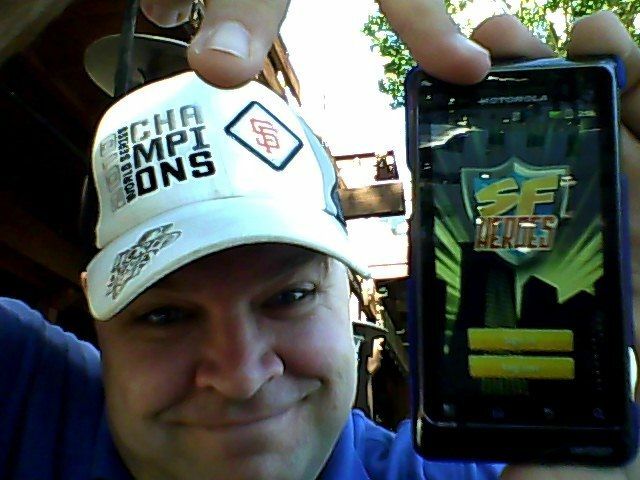 An SF Heroes LIVE player documenting meeting one of the game challenges, to download the SF Heroes app. 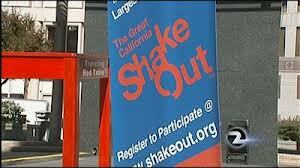 October 18th at 10:18 am marked the 4th annual ShakeOut, California’s statewide drop, cover and hold on earthquake drill. The purpose of the ShakeOut drill is practice and preparation: knowing what to do before, during and after an earthquake and preparing our homes, workplaces and schools for any type of an emergency. 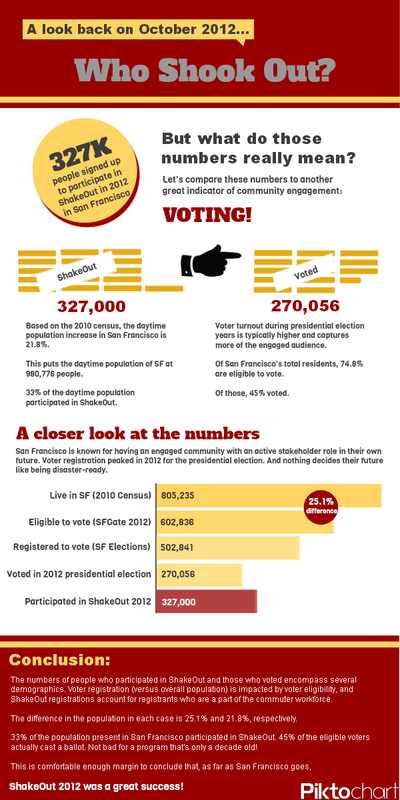 This year, the City and County of San Francisco had more than 328,000 registered participants. You can learn more about this event from the previous em4SF Blog (Who Shook Out? 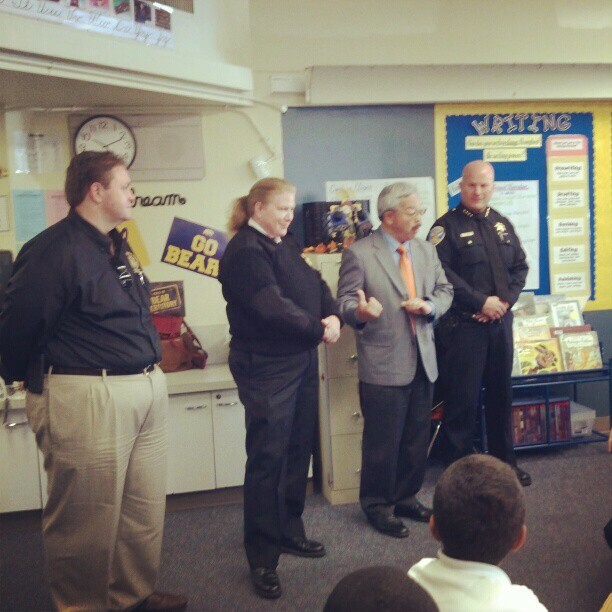 ), but in summary, DEM organized the Mayor’s ShakeOut media event at Drew Elementary School in the Bayview, where the Mayor, Chief Hayes-White, Chief Suhr and our Deputy Director, Rob Dudgeon (pictured left) joined the kids in the ShakeOut drill. Taking place on October 17th, the day of the Loma Prieta Earthquake anniversary and the day before the statewide earthquake drill, ShakeOut, DEM organized and co-conducted a press conference and prep rally in Union Square with several of our emergency preparedness partners, including the American Red Cross Bay Area, to commemorate the Loma Prieta Earthquake and to promote ShakeOut. Picture of press conference taken and posted by KTVU. To commemorate the anniversary of the Loma Prieta Earthquake, DEM created a series of Loma Prieta commemoration videos from a public sector perspective, a community perspective, and a private sector perspective. The interviewees include former Mayor Art Agnos, an active NERT member, and the current Regional Gas Director of PG&E. All videos provide a ‘then and now’ perspective about the earthquake and how San Francisco has become more resilient as a result of what we experienced 23 years ago. From October 11-18, 2012, DEM conducted a week-long emergency preparedness radio campaign on KISQ, KMEL, and KYDL with well-known DJ endorsements to commemorate the Loma Prieta Earthquake on October 17th and to remind listeners to ShakeOut on October 18th. 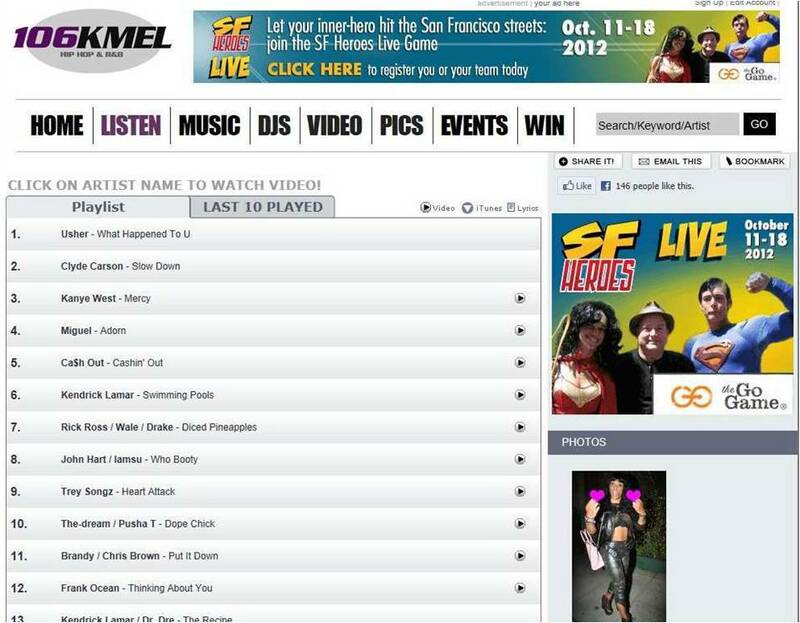 The radio campaign also promoted participation in SF Heroes LIVE. In August, we premiered our smart phone emergency preparedness app (SF Heroes) promotional video, which turned out to be a fun and ‘ungovernent-ish’ way of explaining what SF Heroes is about. The fall season of preparedness began with National Preparedness Month, which is every September. This year we kicked of the nation’s month dedicated to emergency preparedness with the unveiling of an innovative design project spearheaded by AIA San Francisco’s Center for Architecture and Design (AIA SF), a nonprofit charged with educating the public about the value of good design. AIA SF received a small grant from the National Endowment for the Arts to help promote “design thinking” as a way to help solve seemingly intractable social issues for nonprofits and city agencies. AIA SF’s selected design firm, LUNAR, decided to focus on earthquake preparedness. DEM’s role in the project was to consult with LUNAR on the topic of emergency preparedness (and the challenges we face as a government agency trying to create a cultural adoption of emergency preparedness behavior). LUNAR’s role was to develop concepts that spark conversation and ideas, and design a concept for consideration to any organization with an interest and/or organizational mission to promote emergency preparedness. The video sums up the project best, so please enjoy! As the DEM team winds down its support to the Westchester County Emergency Operations Center (EOC), DEM Deputy Director, Rob Dudgeon, shares the importance of always ‘leaning forward’ in our our personal preparedness. We’re transition to days, so we got the night off tonight. That’s good news for Westchester County as it means that they’re able to scale back night operations. It’s good news for us too! I’m happy to help any way I can, but I can’t lie and say that nights aren’t hard when you’re used to working days. I haven’t pulled nights on a regular basis since the 90’s when I was much younger and a riding the box (ambulance). My internal clock is set to days – and suits instead of 5.11’s – but that’s a whole other discussion. It is day 2 of the DEM team’s deployment to support the Westchester County Department of Emergency Services. In this em4SF Blog our Deputy Director, Rob Dudgeon, shares his sentiment about two of the guiding principles of emergency management: step in where needed and support each other; and always learn. On one hand, things are on the mend here in Westchester County, New York. On the other everyone is waiting for the next storm to hit before they relax.